Wolves are one of the many types of wildlife that live in Big Sky, Montana. It's rare to see a wolf, but we definitely share our backcountry playground with these creatures. The next time you head out on a ski tour in the Lee Metcalf Wilderness, climb a remote peak, or backpack through the Taylor Hilgards, look out for wolf prints and listen for the distinct howling of Montana wolves. They are most certainly out there. The scientific name for a gray wolf is Canis Lupus. Males average 5 to 6.5 feet in length from nose to tip of tail. Females average 4.5 to 6 feet. Most wolves stand at 26 to 32 inches at the shoulder. Females weight 60 to 80 pounds. Males weight 70 to 110 pounds. Wolves can live up to 13 years in the wild. They have four toes with claws in an oval shape. They run on their toes, not their pads. A litter of wolves is usually 4 to 6 pups. Pups are born with blue eyes, deaf, and blind. 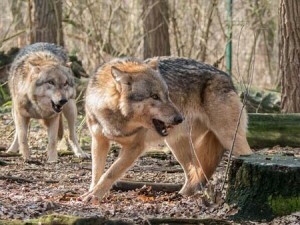 A pack of wolves can range from 2 to over 30 wolves. On average they run in packs between 5 and 8 wolves. Wolves can run at 36 to 38 MPH. Wolves were killed off in Montana in the late 1930's, but were reintroduced in Yellowstone National Park the 1995 and 1996 and their numbers are currently increasing. In 2013, there were at least 625 wolves in western Montana. 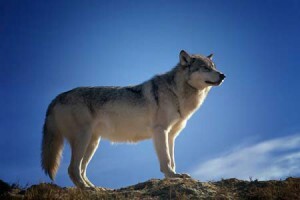 The Montana Fish, Wildlife, and Parks allows up to 100 wolves to be hunted per year. Gray wolves can range in color from gray, black, tan, or white. Wolves prey on elk, deer, moose, and other animals. Wolves have over 200 million scent cells. They can hear up to six miles away in the forest. A wolf's jaw has a crushing power of nearly 1500 pounds per square inch! A wolf can eat 20 pounds of meat in one meal. Wolves can swim up to 8 miles! A wolf howl can be heard up to 10 km away. 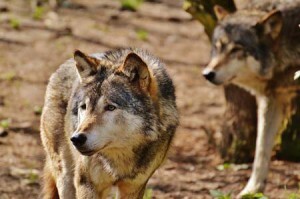 Wolves were the first animals to be place on the US Endangered Species Act list in 1973. Only two wolf attacks have led to fatalities in North America (one in Alaska and one in Canada) during the 21st Century. Wolves do not hibernate and can potentially be seen all year long. While you may never see a wolf in the wild, there's a good chance that a wolf will either smell, see, or hear you stomping around through the woods. The best spot to see a wolf is from the safety of your vehicle while cruising through Yellowstone National Park. If you do see one, remember that wolves are wild animals and should not be approached. Ever. If you want to safely see a wolf in person, visit the Grizzly and Wolf Discovery Center in West Yellowstone to see these amazing creatures up close.